Somewhere I missed the boat. I spent most of my elementary days reading books that I am pretty sure were way above my comprehending. While in elementary school, I read Roots, Great Expectations and others like them. With my desire to read adult books came a loss. I lost the opportunity to read all of the wonderful books that children read. I am trying to make up for it. Seth has been recommending books and I have been gobbling them up as fast as I can. 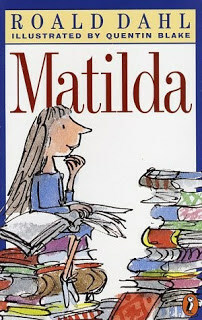 Matilda was my latest read. Matilda was a fascinating book. I know it was written for a child but at times I didn’t feel that way. Although since I have seen the movie all I could do was picture the little teeny Mara Wilson as Matilda. It was a fast read. I was done with the book in a couple of hours, maybe less. I love Roald Dahl’s sense of humor and way of holding his reader captive. I would have loved to have read this book as a child. As a child I was fascinated with anyway that I could take control of my life. I always hated that adults had the last say and sometimes when an adult was particularly frustrating I wanted to get back at them. Matilda doesn’t want to get back at adults, she does. I think as children we all wished we had guts like Matilda. It is a fun book and if you are looking for something incredibly intellectually stimulating that it is definitely worth a read. Try the BFG by Roald Dahl. I remember that being one of my favorites when I was little.